Pizza and Champagne together? YES! 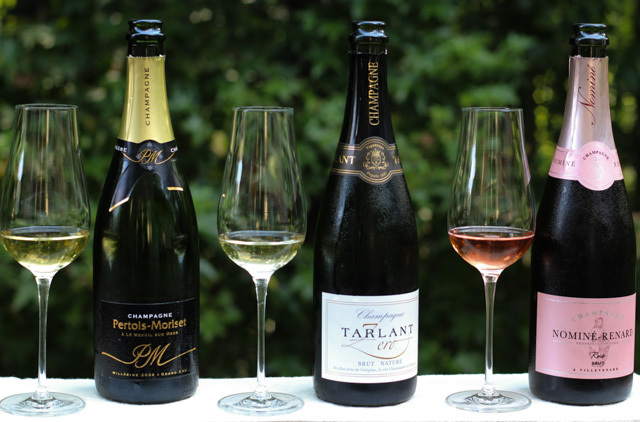 Champagne has a range of flavors from fruity, floral, earthy, nutty, toasty, yeasty, to even honey. Add it’s effervescent bubbles, tart acidity, and general low alcohol all combine to make for a versatile wine for food pairings, even pizza. This month the French Winophiles, a French food and wine loving group that come together the 3rd Saturday of each month to blog and chat on Twitter at 11:00am ET about French wine, are taking a closer taste of some Champagne, specifically, “Grower Champagne.” Check out our host, Martin’s informative invitation post for grower champagne on his blog Enofylz Wine Blog. Grower Champagne is produced by the estate/grower from grapes grown in their own vineyard reflecting a sense of terroir and vintage variation. Unlike the big Champagne houses that grow or purchase their grapes from various vineyards and blend those growing regions and vintages together to create a consistent style year after year. I tasted the following three grower champagnes and paired pizzas with various toppings. Pertois-Moriset located in Le Mesnil-sur-Oger. 3rd generation family owned and operated. The estate holds 18,50 hectares; 12 hectares in Côte des Blancs classified as Grand Cru planted 100% to Chardonnay. 6,50 hectares are in Cote de Sézanne planted 60% to Pinot Noir and 40% to Chardonnay. Medium golden in color with tiny faint bubbles. Medium+ acidity and medium bodied. On the palate intense citrus acidity and lingering minerality. The Tarlant estate has 35 acres of vineyards spread over 55 parcels in the villages of Oeuilly, Boursault, St-Agnan, and Celles-lès-Condé planted to Pinot Noir, Chardonnay, and Pinot Meunier. In addition, there are also smaller plantings of Pinot Blanc, Arbanne, and Petit Meslier. The 12th generation of Tarlant growers currently runs the estate. Pale golden in color with persistent tiny bubbles. Medium+ acidity and medium body. On the palate crisp, refreshing citrus with an underlying smoothness and minerality. Elegant with a beautiful lingering lemony finish. The wine was disgorged November 2017 with a dosage of 11 grams/liter. The estate located in Villevenard. 3rd generation family owned and operated with three grape varieties planted in six different villages (Villevenard, Etoges, Broyes, Allemant, Charly sur Marne, Passy Grigny) and three growing regions (Les Coteaux du Petit Morin, Côte de Sézanne, and Vallée de la Marne) spread across 36 plots. Medium pink in color with persistent tiny bubbles. Medium- acidity and medium bodied. Fruity on the palate with notes of cherry and lemon, nicely balanced with a velvety mouthfeel and lingering finish. 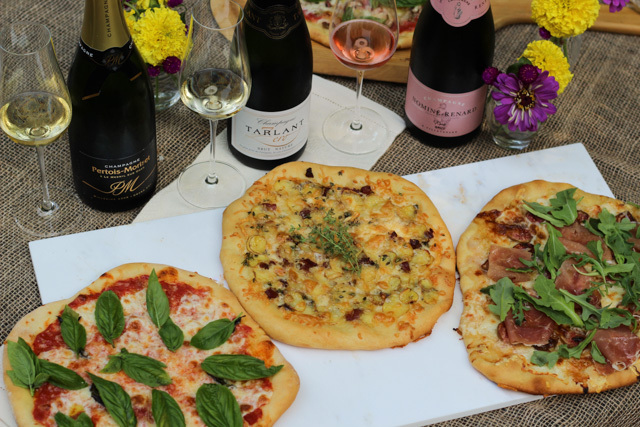 The Champagne Pertois-Moriset Brut and Champagne Nominé Renard Brut Rosé overall paired best with the pizzas. While the Champagne Tarlant Zero Brut Nature was one of my favorite of the three, it lacked fruitiness and was too austere for the pizza. This wine would be perfect as an aperitif or with oysters! Looks like a fun pizza party, Jane. I was interested to see if your zero dosage experience matched mine and it did. I like them, but I often think of them as austere. Getting creative with pizza toppings can make for some great wine pairings. Pizza and Champagne?!? Brilliant. Now I need another bottle!! Thanks for posting. I love the idea of pairing pizza and Champagne Jane! You’ve inspired me to try it. I know I would enjoy all the grower Champagne you described above, especially the Rose! It is amazing when you are actually looking for grower Champagne the gems you can find! I love the way you broke this all down so simply. And the pizza pairings sound wonderful. I would not have thought about the bubbles matching the acidity in the tomato sauce! The figs with the rosé brut sound perfect. What an amazing way to mix and match flavors with the wines! Thanks Robin, Champagne should not just be for special occasions, especially if Champagne is a favorite. Getting creative with pizza toppings can satisfy both a pizza and Champagne craving. I really do love pizza and find that the endless options make it, perhaps, the perfect desert island food. I can imagine that brut nature rather disappeared under all the flavor and texture of the pizza… but the truth is this post illustrates that there is much range in Champagne, something for every instance. So true, Champagne pairs well with so many foods with it’s bubbles, acidity, and low alcohol. Great post, Jane! I ADORE pizza and I already love it with Lambrusco – the fizziness is so much fun – but honestly, I’m to sure I’ve done much Champagne with pizza. Until now. Love how you broke it down, especially reviewing the dosage levels. Cheers!